The band photo date was listed incorrectly on the latest calendar revision. We will take photos THIS FRIDAY, JULY 27, not Thursday. Order forms for individuals are available in the band room. Please arrive a little early on Friday to get into your uniform before 8:00 am roll call. Please remember to pay band fees for the season. Fees were due July 12, and we're currently struggling to finance band camp. Invest-in-the-Blue materials are available in the band room, and the contribution is tax deductible. Many thanks to those who have paid on time! Band Camp Detailed Schedule-- NEW!! Please take note of the new detailed band camp schedule, posted on the Moody Blue Devils Yahoo Group. Our NEW dismissal time is 3:15 daily. Officers and assigned band families will stay until 3:30. Thanks to the hard work and dedication of our new marchers and section leaders, I am now confident that we can accomplish our goals of having a show on the field by the end of band camp while still dismissing an hour earlier than previously announced. Kudos to those who worked so diligently during rookie camp! You earned the reward of an earlier dismissal for all band members. See you tomorrow. We have a few surplus band shoes for sale, half price. First come, first served. $15.00 per pair, made payable to the Moody Band Boosters. Otherwise, new shoes will be available at 1:00 on Monday for $30.00 per pair. All students should have acquired shoes before photo day on 7/27. Parents and Guardians of rookie/drum/auxiliary camp students: If you are willing to volunteer your time at the band field tomorrow (Friday), 8:00 am until 12:00 noon, we would be grateful for a rotation of chaperones to help with some occasional student needs (insect bites, forgotten water, sunscreen, band aids, smiles and encouragement, etc.). Your help will ensure our last day of rookie camp goes as smoothly as possible. Please e-mail brad.sargent@sccboe.org if you're available. For those available to chaperone at next week's full band camp, please e-mail susanalittleton@aim.com. Rookie/Drum/Auxiliary camp is 7/18-7/20, 8:00 am-12:00 noon daily. As announced previously, all new marchers, section leaders, officers, captains, drum line and pit members, and drum majors should attend. All others are welcome to attend and review marching skills. Be sure to eat breakfast before arriving (no dairy products), bring plenty of water, sunscreen, wear closed-toed shoes, and bring a snack if desired. Dismissal is at noon. Students should have returned a physical, less than one year old, completed by a doctor. Students without a current physical will observe but will not be allowed to participate. The band and auxiliary units will be photographed for the football program and yearbook on Friday, July 27, 8:00-10:00 am. Students should be sure to bring long, black socks and wear a navy or black t-shirt under the uniform. Students who do not yet have shoes should see Dr. Sargent to make temporary arrangements. Photo order forms will be available in the band room. For any students who need band shoes, Mr. Frank Godfrey will be in the band room on Monday, July 23 for a fitting. Please bring cash or a check made payable to the Moody Band Boosters in the amount of $30.00. The deadline for ads is quickly approaching and many vendors have not placed ads yet! Would you please contact them again to remind them to place the ad? If they have any problem with the website they may contact Mrs. McGinnis at 640-1605. Also, if you would like to know which vendors have placed ads already (and how much you have earned!) please email Mrs. McGinnis at elizabeth@communitypca.net. Susan Littleton's email address was incorrect in the previous posting for band camp chaperones. Please use susanalittleton@aim.com. You may also reach Mrs. Littleton by cell at 205-533-5588. If you are the parent or guardian of a Moody band student and would like to assist with chaperoning during band camp, please send an e-mail to Susan Littleton at susanlittleton@aim.com to indicate your interest and availability. Thank you! Mr. Frank Godfrey from DeMoulin Uniforms will be in the band room on Monday, July 23rd at 1:00 pm (during band camp) for band shoe fittings and order placement. If you are in need of band shoes, please bring a check for $30.00 made payable to the Moody Band Boosters. Students will receive shoe orders only after payment is received. Included with your 2012 band fee is one Under-Armor style t-shirt to be worn by your student as part of the band uniform. You specified the size of that shirt when you completed your student's information form in the spring. 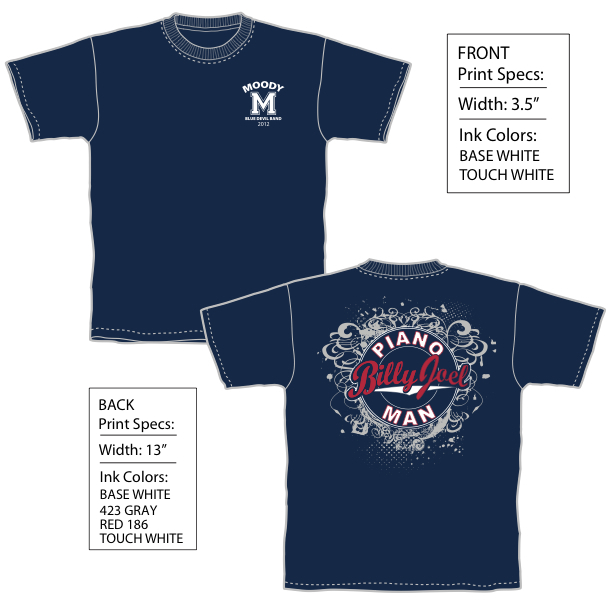 If you wish to order additional shirts as extras or for your own use, please complete the form in the files section of our Moody Blue Devils Yahoo Group (a link is provided on our website homepage) and submit with your payment by Friday, August 3. Hard copies of order forms will be made available at the next rehearsal in the band room. Because of time constraints and setup fees, we are not able to accept any orders after August 3. All shirts are $12.00 each. If possible, an image of the t-shirt design will be uploaded in the next post. Stay tuned! Please remember we have summer band this evening, 6:00-8:00 pm. This is an excellent time to pay band fees and turn in forms. All forms are due BEFORE the first day of rookie camp. Please note: July 19 is now a regular summer band rehearsal, not a band photo. Band photos will be rescheduled during band camp. A revised master schedule is forthcoming. See you tonight! MHS registration and band camp schedules will conflict this year. Our plan is to dismiss students from band camp at the appropriate times. Students should return to camp activities immediately after registering. The scheudule is as follows: Seniors-Tuesday, July 31st, 9:00 – 11:30 am. Juniors- Tuesday, July 31st 1:00- 3:30 pm. Sophomores- Thursday, August 2nd, 9:00-11:30 am. Freshmen- Thursday, August 2nd, 1:00 – 3:30 pm. Registration forms are available online at www.stclaircountyschools.org. or www.moodybluedevils.org. All students will need 2 different proofs of residency (current utility bills) and up-to-date immunization records (if notified by the school nurse.) Students may purchase lockers ($15.00) and parking permits ($20.00) with proof of insurance, driver’s license number and tag number. School starts on August 20th. Please call the school at 640-5127 if you have any questions. New students to St. Clair County may come in any time between 8:30 -2:30 (except Fridays) to register or pick up paper work. A counselor will be available to meet with new students on July 25, 2012 8:00am – 2:30pm or 9-11am on Aug 16th. Students named as participants in this Saturday's leadership workshop should download, print, and complete the medical form which has now been added to the files section of the Moody Blue Devils Yahoo Group. The forms are due to Dr. Sargent before departing on Saturday morning. Thank you! The following officers and captains are receiving a scholarship from the band boosters to attend the Tim Lautzenheiser leadership workshop at Homewood High School on Saturday, July 14. The bus leaves the Moody band room at 7:00 am. After the workshop, we stop for a late lunch, then return to the band room by 3:00 pm. Names in brackets are those who have declined the scholarship and will not attend with us. If your name appears and you are unable to attend, please notify Dr. Sargent immediately at brad.sargent@sccboe.org so a substitute can go in your place and the scholarship will not go to waste! Attendees: Andrew R, Scott C, [Breeanna M],Jaysea A, Kayla C, Giorgia E, Max G, Clay F, Jon McG, Danny G, [Claire C], Courtney F, Emilee H, Victoria D.
Several students are in need of rides to and from the upcoming rookie camp and band camp. If you are willing to offer a ride or if you are in need of a ride, please have a parent or guardian send an e-mail to brad.sargent@sccboe.org with "Carpool" in the subject heading. Include your name, indicate your need of a ride or your offer to help provide one, and please include any contact information you would wish to share with others. A list will be compiled and made available before camp begins.